Whether or not you’re into smart home gadgets and gizmos, there’s one connected device we think anyone and everyone who owns a home will appreciate. Wouldn’t it be nice to never have to deal with the keypad attached to your garage door opener again? Seriously, how is it possible that there are so many different models of garage door opener and every single one of them has an awful keypad!? The buttons are so hard to press and it always takes at least three tries to get it to actually work. 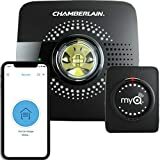 Well instead of dealing with that nonsense, get yourself a Chamberlain MyQ Smart Garage Door Opener MYQ-G0301 so you can control your garage door with your iPhone or Android phone instead.